LeeQin Bluetooth FM Transmitter achieve the stereo music lossless transfer to your car speaker, to grant most crystal sound quality. Please be noted, due to radio frequency interference and car ground loop noise, it is almost impossible for any transmitter to produce a perfect audio, but ToHayie does one of the best work in the market. 2. Super Clear Large Screen. The 1.4 inches large screen will show the car battery voltage level, as well as the FM frequency. With Dual 5V/2.1A USB charging port, you can charge your phone and other devices in fast speed. Built-in microphone feature can set free your hands during answer the calls and help you safely drive. Multi-function one-click design: Press to answer the phone call, Play/Pause and mode switch . 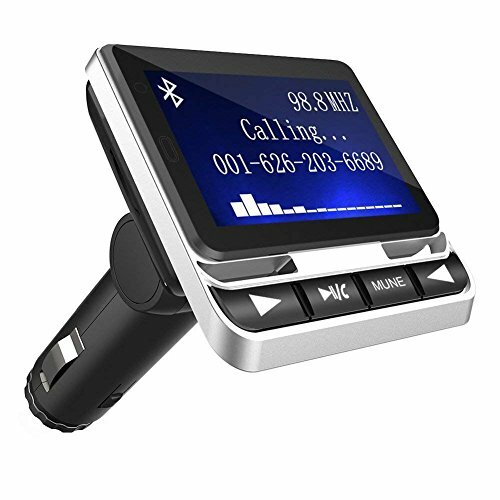 Big rotating knob for easily adjust the FM frequency and Previous song / Next song, supports caller ID voice reported. CHARGING STATION - Comes with a 5V-2.1A charging port to charge most USB devices. Such as apple iPhone 7 6 6S Plus；Android Smartphones, Power Bank etc, better charging performance! BROAD COMPATIBILITY - LeeQin car fm transmitter works with Bluetooth enabled devices, like iPhone, iPad, iPod, Tablet, Smartphones or MP3, MP4 Players via 3.5mm audio jack. If you have any questions about this product by LeeQin, contact us by completing and submitting the form below. If you are looking for a specif part number, please include it with your message.